As February comes to a close I am still pondering the future, if any, for Color Me Daisy. If you missed it, we announced with the release of our February kit that we were no longer going to offer monthly kits (the official announcement can be found here) with the original thought that we would do periodic kits 4-6 times a year. Life has changed dramatically in the past 2 years, we have an active 1 and 3 year old. My job is incredibly non-stop busy and I am working a lot more than I was a year ago. I don’t want to miss anything with my two little guys and I want to enjoy life a bit more. I turn the big 4-0 at the end of the year and it is making me take stock of where I want to end up come the end of 2010. I decided before I think about any future direction for CMD I need a break from kit planning and the business side of scrapbooking. I got to a point where my heart wasn’t in it, I wasn’t scrapping and when I did, I was just slapping it on the page. While life is still busy, I have had a lot more fun this past month with my family and my scrapping. These two were based on a CK Sponsored class, but I don’t remember which one and I am guessing it was a couple of years ago at least based on the products used. But I think they are pretty timeless pages and I love them. 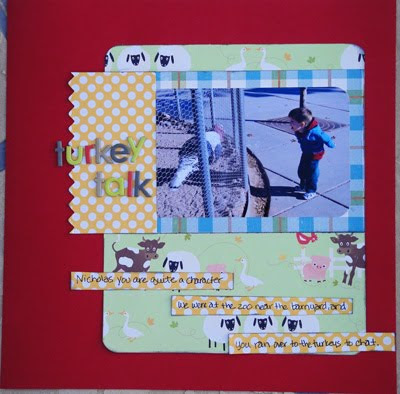 When I finished up these I had a sheet of Kraft cardstock still and lots of scraps, so I used them to make my least common layout for my Library of Memories class at Big Picture Scrapbooking that I am repeating as an Alumni this year. 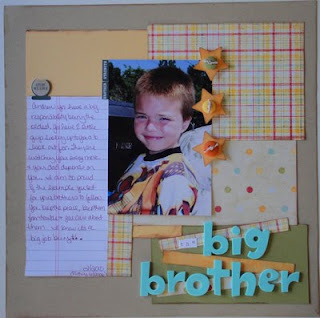 My least common layout was People We Love and Why, this is about my nephew Andrew who is a big brother to two and helps his Dad (my brother), who is a single dad, a lot. I am proud of the young man he is becoming and the good example he is. 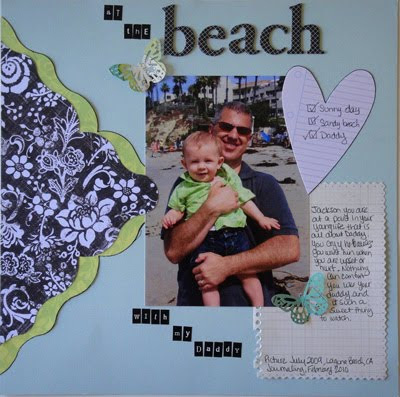 From this ad, I created this layout from our trip to California last July for my Grandfather’s funeral. One morning, when we didn’t have to be anywhere early we drove down to Laguna Beach, grabbed Starbucks and had breakfast on the beach. It was Jackson’s first trip to the beach. But the journaling is about how attached Jackson is to Mike. Everything is all about Daddy for Jackson right now. 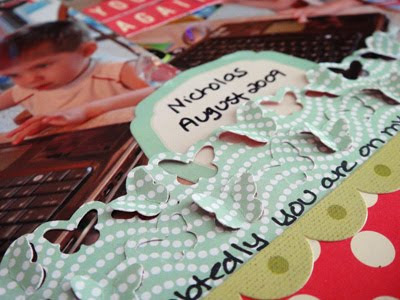 Most of the supplies used for this was from a mystery box I picked up from Scrap Attack Scrapbooking. I think for less than $50 with shipping I got a huge box of goodies with a original value of about $150. I sorted through it, kept what I wanted and anything I didn’t think I would use went into the yard sale pile for the LSS. I figure I didn’t take much of a loss and ended up with some cute things. The Thickers and small letters were not from the mystery box. 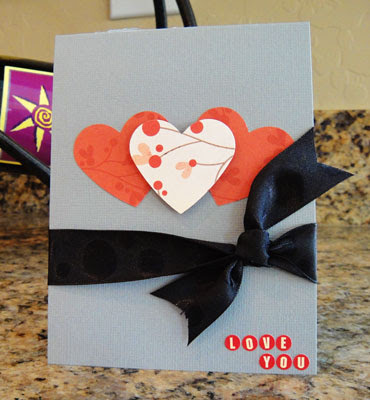 I made this card for Mike for Valentine’s Day. 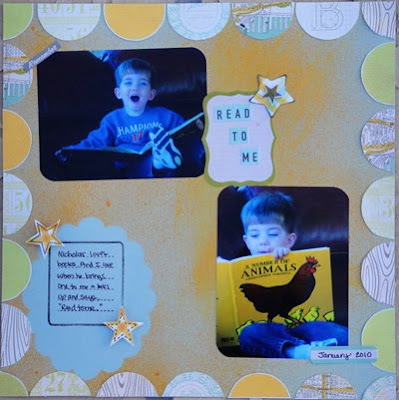 We had a crop over at Color Me Daisy this past month and one of the challenges was to make something with only what was within reach. It worked out for this card, ribbon, cardstock, a punch, patterned paper, foam dots and stickers were spread out on the desk and this came together pretty fast. Since I am cutting back at Color Me Daisy I had to fill the void. I am still a huge fan of kits and always will be. I love to scrap with a coordinated kit, it helps me focus, I didn’t have to spend the time to get the “ingredients” together. It simplifies the options in the room that I scrap, i.e., the mini store. LOL! Anyway, long before CMD was a thought in my mind I subscribed to Mosh Posh and still do. I never cancelled my sub even after I started CMD, I thought that for the most part the kits from Mosh Posh were very similar to my style and several kits overlapped what I did at CMD so they rounded out each other pretty well. So in February I got their kit featuring October Afternoon, Farm Fresh. Not really a line I would have picked, but I also saw a sketch on their blog that I liked and wanted to use. We were walking in the barnyard section of the zoo and Nicholas ran over to the turkeys and did this, and I actually got it on camera. The month before we fed the turkeys and chickens in a Zoo Animal Program and he had a ball. We went in the cages with the guides and he was able to pet the chickens and feed them. He wanted to pet the turkeys too, but they wouldn’t let us near them. We just threw their food and stood back. I guess they are aggressive with little kids. But when we were back on this day, he ran over and started talking to this turkey. And this paper that I never in a million years would have thought I could use, ended up featured on a page. Another kit club I have joined to fill my CMD void is Studio Calico. I had heard of them, I don’t live under a rock :)-, and checked them out several months ago. When we decided we were going to cut back on the CMD kits I was looking for another kit club so I could get a monthly fix. I like that their kits are so different from what I would put together; but, I love all the products that are in them. I knew their kits would stretch my scrapping style. It took me a couple of months to get around to using one though. 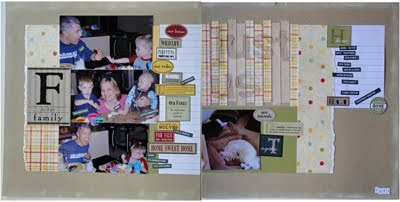 They have challenges on their blog each week, the perfect thing to get my scrapping. 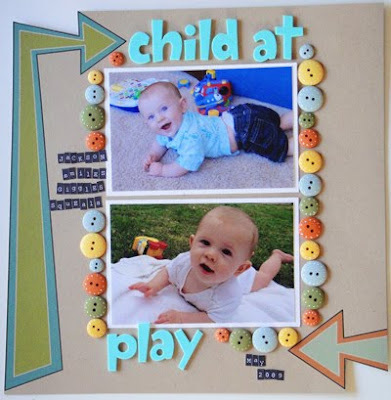 This challenge was to use baby colors on a layout. 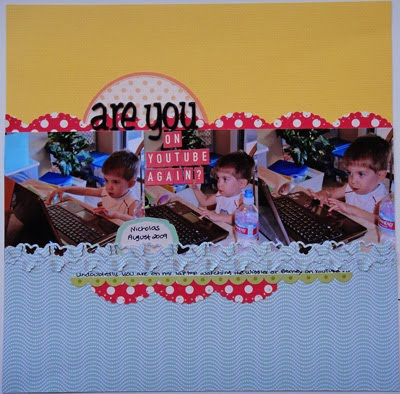 The layout didn’t need to be baby themed and since right now I am over those pages, I did this one instead. The DT over there mists a lot, and it is inspiring me to give it a try. I was looking at one of the SC exclusive papers in the kit and noticed that the circles on the paper created a perfect frame on the edges. So I cut out the circles, misted my cardstock using a chipboard piece from a Maya Road Mini Book and placed the semi-circles around the page. This is to tell the story about Nicholas and books right now, he loves to read and I love it when he comes over and says “Read to Me”. They also have a weekly sketch challenge on the blog at SC and this was from this past week. I love these pictures of Nicholas on my laptop. He loves to watch YouTube videos of the Wiggles, Barney and Blues Clues on my computer and one afternoon last summer I caught these pictures of him. I also got to try out my new Martha Stewart Butterfly border punch. Love it! 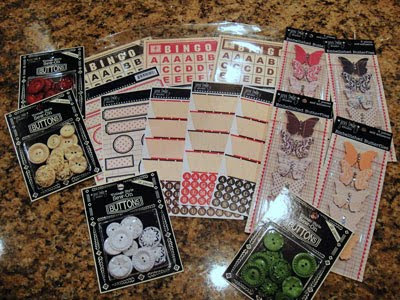 Rounding out my recent scrap adventures….I got a box in the mail a few days ago with all this new Jenni Bowlin goodness. I can’t wait to get these on a project! And lastly, I recently received this in the mail. 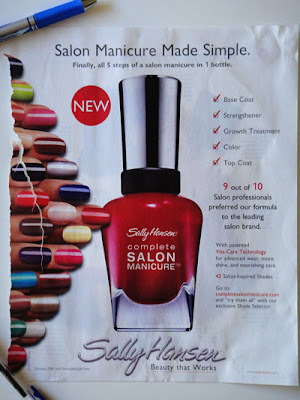 Assuming there really is a next Color Me Daisy kit I am quite certain something from this catalog will be in it…. If you are still here…have a great Sunday! 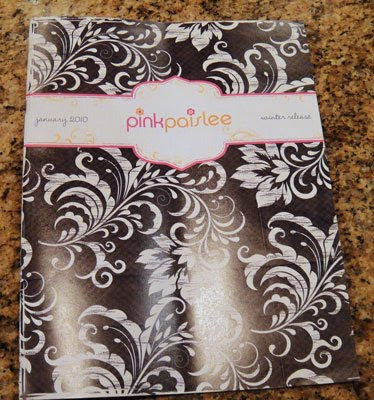 I am so glad that you are finding joy in scrapping again, Michelle, and so excited to see what you pull from that Pink Paislee catalog! Hey Michelle! So happy to read that you are enjoying life again!! I can't imagine how much you had on your plate and how you got everything done! My thought are always going to be with you and your family especially your little dudes!! They are soooo cute! !